Leading elite Australian Female Referees Kate Jacewicz and Sarah Ho have been recruited by Capital Football as referee coaches and mentors for the 2017 NSR Kanga Cup. The tournament, held between July 2nd – July 7th this year, will have a referee group over 200-strong officiating more than 1100 matches throughout the week. The Kanga Cup is the largest junior football tournament in the Southern Hemisphere, and is held in Canberra annually. “This is an exciting enhancement to our referee support team which provides coaching and mentoring to our referees throughout the week long Tournament,” Capital Football CEO Phil Brown said. Kate and Sarah will be part of the Referee Academy based at the AIS during Kanga Cup which includes young local, interstate and overseas referees. They will both be involved in Academy technical sessions as well as providing coaching support to both local and Academy referees on a daily basis at the many hosting venues of the 2017 NSR Kanga Cup across Canberra. “This is an important investment to ensure our young referees at all levels receive the right support and coaching during the Tournament,” Brown said. 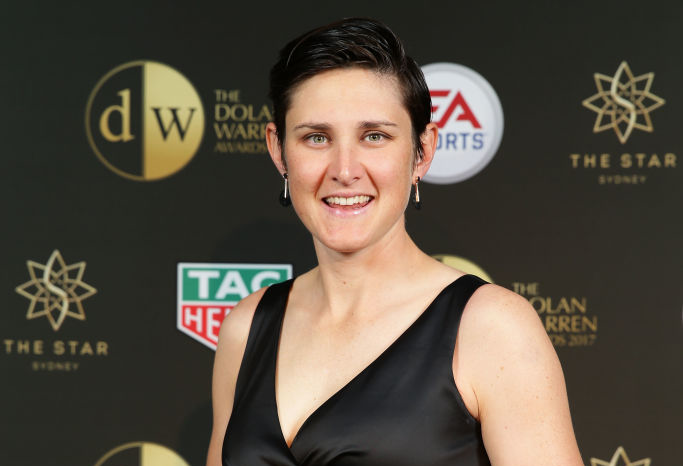 Kate Jacewicz has been named the Westfield W-League Referee of the Year seven times and is Australia’s most experienced female referee. She started refereeing when she was 13 years old, was appointed as a FIFA referee in 2011 and recently was in charge of the final of the 2016 FIFA U17s Women’s World Cup held in Jordan. She has also refereed eight out of the nine Westfield W-league Grand Finals including the recent 2016/17 event. Sarah Ho is leading the way for female officials in Australia. She was appointed as an assistant referee for the 2015, 2011 and 2007 FIFA Women’s World Cup as well as the 2008 & 2012 Olympic Games. 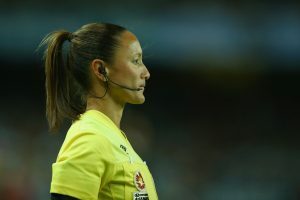 Sarah was the first female referee to be selected for the Huyindai A-League Assistant Referee’s panel and the AFC Men’s panel. Sarah began her refereeing in the Nepean area before moving to the National Youth Championships level and gaining her FIFA badge in 2004. “Both referees bring significant knowledge and experience to our coaching efforts at Kanga Cup and we are very happy they have made this commitment and investment to help in the development of our junior referees,” Brown said. Caption’s: Top, Kate Jacewicz poses with the W-League Referee of the Year award during the FFA Dolan Warren Awards at The Star on May 1, 2017 in Sydney, Australia (Photo by Matt King/Getty Images). Above, Elite Referee Sarah Ho (Photo by Getty Images). Tags Capital Football ffa football kanga cup Kate Jacewicz Referee of the Year referees Sarah Ho W-League.